Bellmont Partners PR began pro bono work last October to help the Minnesota Fire Service Foundation raise $600,000 for a new memorial to 194 firefighters who have died in the line of duty since 1881. Bellmont Partners PR began pro bono work last October to help the Minnesota Fire Service Foundation (MFSF) raise $600,000 for a new memorial to 194 firefighters who have died in the line of duty since 1881. To be ready to commemorate National Fallen Firefighter Memorial Weekend in October 2012, the foundation needed the money by December 31. MFSF president George Esbensen says fundraising began in July, but efforts weren't getting enough traction to meet the goal. The agency built on MFSF's initial grassroots outreach to firefighters by focusing messaging and using media relations and social media outreach to broaden awareness. Esbensen, who is a fire chief, says there's no formal network to reach firefighters (nearly all are volunteers or on-call only). “Putting the message out in the broader media helped reach many fire departments and legitimized [the campaign] – for the public and firefighters,” Esbensen notes. Statewide media relations launched during Fire Safety Week (October 9-15). Editorials by prominent firefighting community members were solicited and distributed. Chad Weinstein, president of the Ethical Leaders in Action in Minneapolis, provided an unsolicited editorial, which Esbensen says really helped. Outreach materials created included talking points for fire chiefs and letters outlining need and urging organizations and individuals to donate and/or coordinate fundraisers. The agency interviewed family and colleagues of fallen firefighters and wrote narratives that included what the new memorial would mean to surviving loved ones. 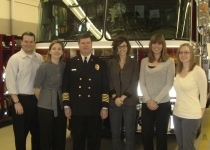 The stories were pitched to media, sent to fire chiefs, and posted to the foundation's website and Facebook page. Funds increased from $115,000 ending September to $600,000 on December 2. “More than 90% of that is due to Bellmont,” Esbensen says. By mid-January, $645,000 had been raised. Sixty-two local media stories have run (nearly 3.2 million impressions). October 3 to December 13, Facebook page likes increased 63% from 236 to 384; post views increased 80% to 57,000; and post feedback increased 244% to 877. Bellmont will continue pro bono support, including promoting the ground breaking in April and a September 30 dedication.